The home and household IoT market represents massive opportunity for companies and consumers alike. Here are the top 3 home IoT opportunities right now. How big is the home IoT marketplace? You might need to step back to see this one… The household IoT market is unbelievably large and growing by the minute. 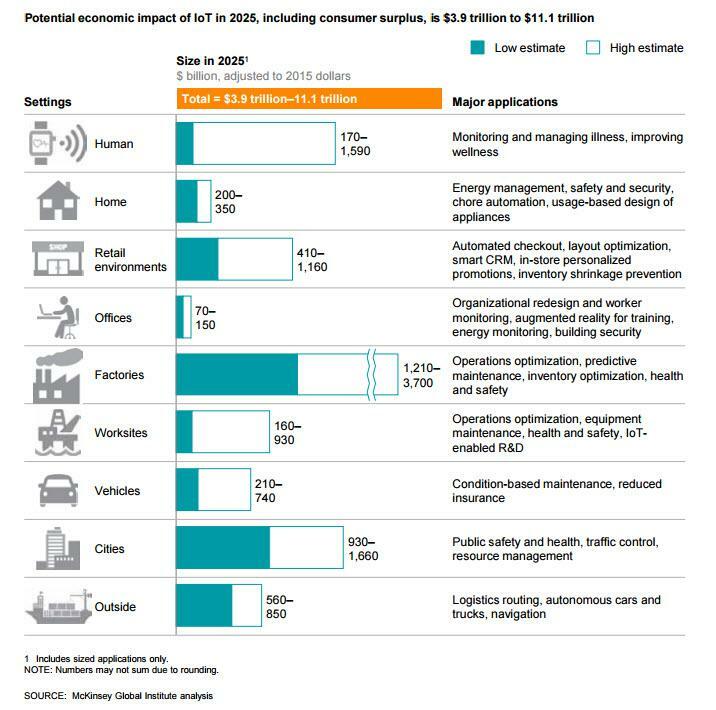 Zooming into home and household IoT, you’ll see a high-end estimate of $350 billion by 2025. However, a Business Insider analysis finds an even bigger opportunity at play. Yes you read that right…faster than smartphone growth. Wow. That puts a target of $490 billion in revenue from connected-home devices by 2019. Regardless of how you look at it, the market is massive and set to absolutely explode. Is your company ready to get a slice of this? So who is making the money in household IoT devices? And then we have a handful of service providers putting packages together in an attempt to make things simpler for the customer. These are largely home security companies and cable companies. I have yet to see someone offer a complete home IoT vision. Offers consist of narrow IoT packages that focus on the core item that service provider offers. In other words, the big companies are playing it conservative. But that puts the burden of understanding and implementing the IoT landscape on the consumer. There is a lot of worry on the mind of consumers. Here are the top 3. There is simply too much choice. Most people looking for a smart, connected home do not want to spend time researching and piecemealing a home together. Consumers are confused by the wide array of options available and don’t know where to start. They also do not want to do the research. Not only does this include device choice, it also includes install, service, and use. If I add 5 different IoT devices to my home, such as a nice sprinkler system controller, thermostat, lighting system, door locks, and surveillance…do I really want to deal with 5 different smartphone apps, 5 sets of usernames and passwords, and 5 different service plans? And neither do consumers. Household buyers want unified platforms that simplify and improve their lives, not make it harder. Did you know hackers are exploiting home IoT services on a regularly basis? Fridges have been hacked to capture email addresses, access the home network, and more. Security appears to be a latent concern for manufactures, which puts consumers at risk. And consumers purchasing decisions are impacted. Privacy and security are legitimate concerns. “Smarthome services are vulnerable to cyber attack because most service provider don’t consider the security in the initial stage.” – Yoon, S., Park, H., & Yoo, H. (2015). Computer science and its applications. Heidelberg: Springer. Retrieved July 20, 2016, from Springer Link. Alright, we have massive market potential. But we have some stumbling blocks to adoption. Who can best solve these challenges? Consumers want the Tesla of homes. To solve the piecemeal problem, whole-house packages are what to deliver. Save the consumer the research, the install, and the headache. Rather than managing an array of accounts, apps, and service providers, consumers want unification. They want simplified, centralized control. This control point should cover the entire connected-home experience. This means open standards, industry standards, interoperability, APIs, and microservices. Manufactures building walled gardens will lose. The message is clear: don’t try to lock consumers into your ecosystem. The winning provider will allow their devices to interoperate and will have a centralized hub that can manage an entire household. It will be difficult to count on individual devices to all maintain adequate levels of security and updates, especially given the speed of emerging threats. Similarly, managing unique privacy policies can quickly become overwhelming for customers. As such, a centralized hub (whether onsite or cloud based) to manage security and privacy across devices will provide a winning combo that will help put the power back in the consumer’s hands. Think about the way your phone is able to centrally manage permissions for your apps–this is what customers need. Who is in the best position to deliver on these top 3 opportunities? Home builders. When buying a new home, consumers are already taking steps to pick out features and packages to customize the home. IoT home packages fit in perfectly. The home builder can handle the choice problem. Since it picks the package, it can also go for a unified solution and partner with a company (like BETSOL) to provide the hub and ongoing services. Consumers can buy the Tesla of houses. The household IoT market taking off, yet unsettled. The right company will be able to capitalize on these opportunities and deliver the future to home owners.